Our Residential Care Home is designed to offer residents the highest level of independence possible. Residents who may require a level of assistance similar to an assisted living community will benefit from the amenities that our residential care home has to offer while enjoying safety, security, and peace of mind. Visit our reviews page and see what others are saying about us! Special Touch Living Care Home provides a home-like environment that blends the comfort of private and semi-private residential rooms. Nursing services are available. The goal is to maintain a high level of activity and provide residents with the ability to go about their daily lives and enjoy socializing with others in an independent home-like environment. Special Touch Living’s nursing staff provides medication and care oversight. Our recreation team creates a wide array of activities for the mind, spirit and body. 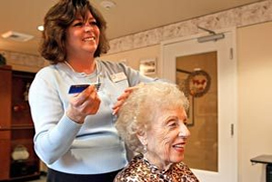 Special Touch Living Residential Care Home accepts private pay, long-term care insurance and Medicaid. To learn more about the quality care that Special Touch Living Residential Care Home offers, or to make an appointment to visit us, please contact an Admissions Coordinator now. © Special Touch Living All rights reserved.